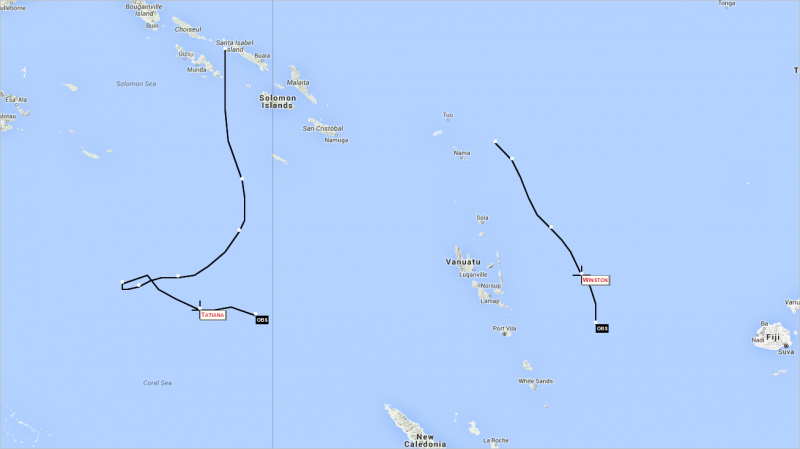 Historical track of TC Tatiana and TC Winston to 7am Friday February 12th 2016. Image via NOAA Earth System Research Laboratory. TC Winston was located between Vanuatu and Fiji (about 780km southwest of Rotuma or about 610km west of Nadi) at 6am today (Friday 12th February). The central pressure of the cyclone was estimated to be 978hPa , making it a Category 2 cyclone and it was moving to the south at about 9km/h. Winds close to the centre of the cyclone were expected to be around 111 km/h, increasing to 120km/h in the next 6 to 12 hours. TC Tatiana was located over the central Coral Sea 1070 kilometres northeast of Fraser Island at 1.40pm today (Friday 12th February). The central pressure of TC Tatiana was estimated to be 985hPa, making it a Category 2 cyclone , and it was moving to the east southeast at about 8 km/h. Winds close to the centre of the cyclone were expected to be around 95 km/h with wind gusts up to 130 kilometres per hour. True colour satellite image showing the location of TC Tatiana and TC Winston at 9.40am, Friday 12th February 2016. It is unusual for two tropical cyclones to be named within such a short period of time (6 hours) of each other, when they are so close to each other. Usually tropical cyclones require at least 15 degrees of longitude between each TC formation. 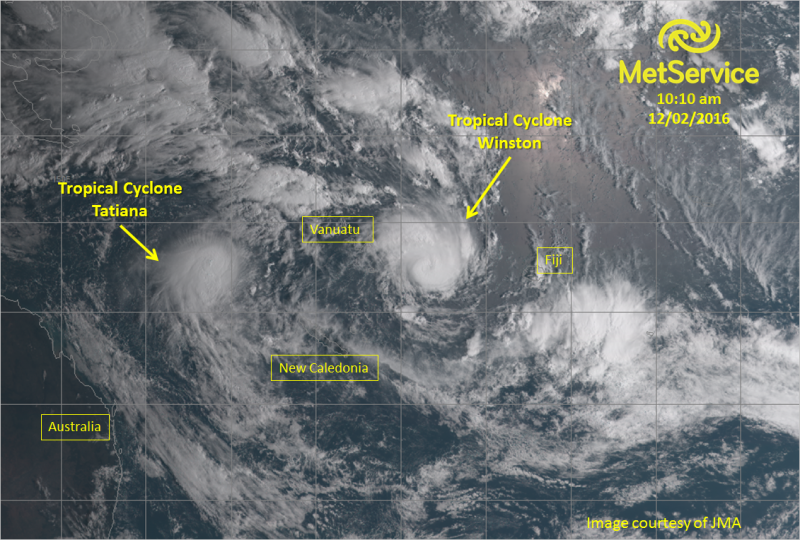 Winston and Tatiana have both formed dispite this, with models expecting Winston to be the stronger cyclone. TC Winston is expected to intensify while moving south southeast then turn gradually more southeast over the next 48 hours. This is shown in the forecast track map below. Tropical cyclone Tatiana is expected to gradually intensify while adopting a track towards the southeast during today. This is shown in the forecast map below. Forecast track of TC Tatiana produced by Bureau of Meteorology, TCWC Brisbane. 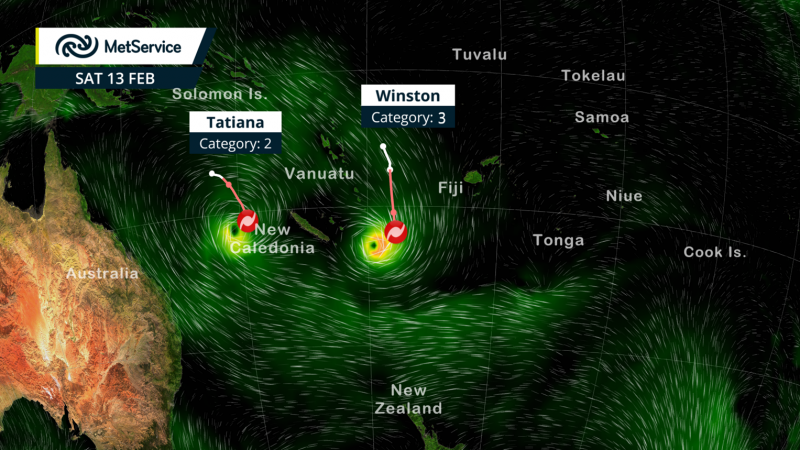 Over the weekend TC Winston continues on a southeasterly track, while TC Tatiana weakens as it moves south. TC Winston eventually moves away to the east. Neither of these tropical cyclones is expected to affect New Zealand over the weekend. 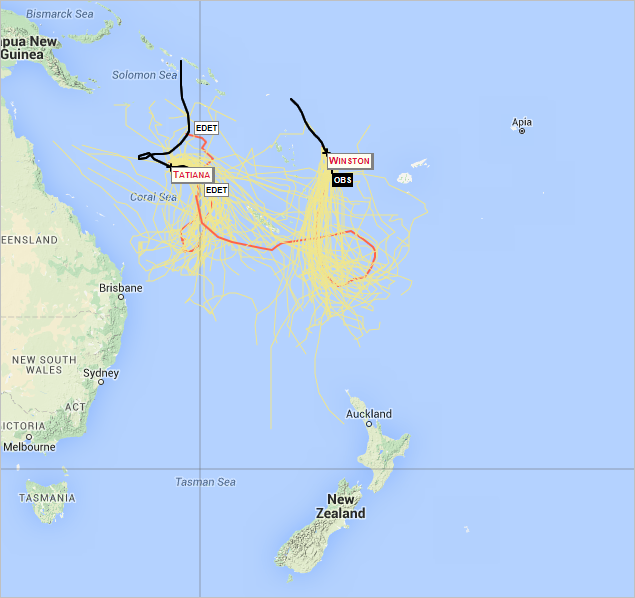 Forecast positions for TC Tatiana and TC Winston for Saturday 13th February produced on Weatherscape, by MetService. Bright colours over the ocean (green, yellow & orange) show areas of intense wind. The white line is the observed track and the pink line is the forecast track for the cyclone. The graphic below shows a range of possible future tracks for both tropical cyclones based on data supplied by the ECMWF. A majority of these have TC Winston moving south before turning east, and TC Tatiana is expected to continue east southeast. There are currently no direct impacts expected for New Zealand as a majority of the models keep both cyclones well to the north of us. Indirect impacts could be an increase in swell and easterly winds for northern areas, neither of which are expected to be severe at this stage and MetService have no warnings associated with cyclones in place for New Zealand at present.